A few weeks ago I wrote about the change we decided to make to the upstairs pyjama lounge. It’s taken a while but the two original window frames have now been removed and the French doors and smaller side windows have been installed. It makes a big difference to the outlook and the whole feel of things from the top of the stairs. I’m pleased I insisted! This is how things looked on my previous visit. French Doors onto upstairs veranda. One advantage of a rather slow building experience is that it’s given us lots of time to think and make changes we mightn’t have considered if progress had been faster. And so far all the changes have been worth it. We’re having a very hot October and various innovative headdresses have appeared. 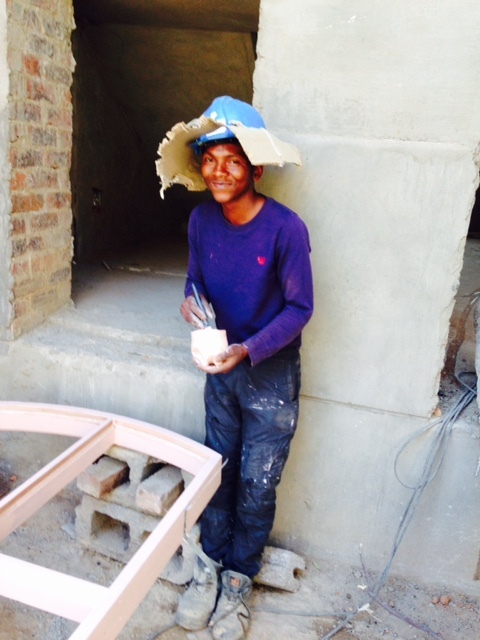 Below is Innocent who has added a creative cardboard brim to his hard hat. He is painting the staircase window frame. I have just returned from Middle Earth. Or at least, that’s what it feels like. 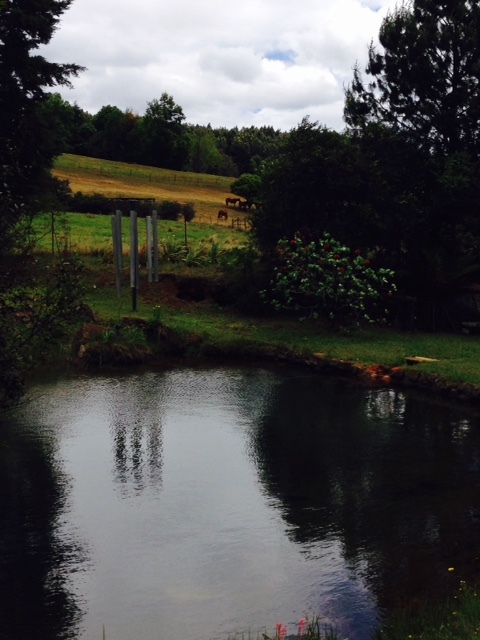 I had reason to travel to the Natal Midlands this weekend and while there, being alone, I decided to take myself off on my own little Midlands Meander. 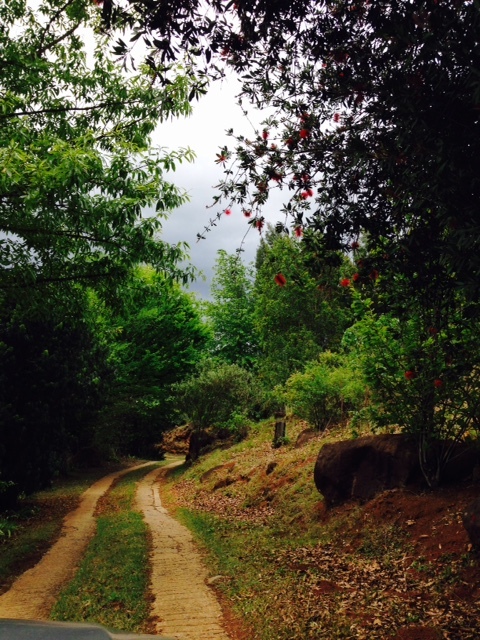 It is a beautiful part of the country which not even the very inclement weather could disguise. Winding lanes, paddocks sheltering sleek horses or jersey cows can leave one feeling quite confused as to ones whereabouts. I half expected to see Peter Rabbit popping through the garden gate but such notions were soon dispelled by the scampering of vervet monkeys across my cottage roof. Quite fortuitously, on the way down to KwaZulu-Natal (or KZN as it’s known locally), while stopping for coffee, I’d bought the latest issue of South African Country Life magazine, beguiled by the heading ‘Make Merry in the Midlands’ on the cover and once I’d checked into the Old Halliwell Country Inn and thawed out slightly, I checked out the article and a paragraph dedicated to Culamoya Chimes caught my attention. 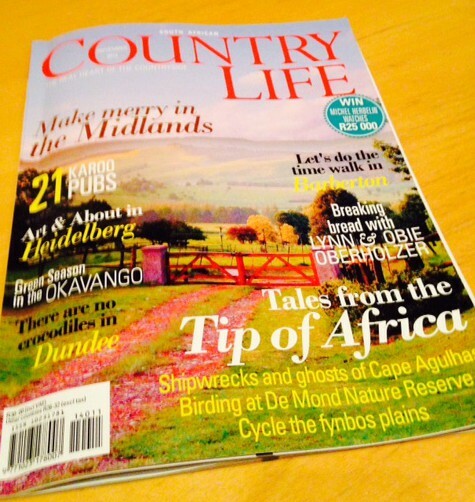 November 2014 Country Life magazine. For some reason I have always loved Bells. I love their shape and I love the sounds they make. The pealing of real church bells can stop me in my tracks and waking to their call on a Sunday morning is something I’ll miss when we move from this house which is just three doors down the road from St Martins in the Veld. 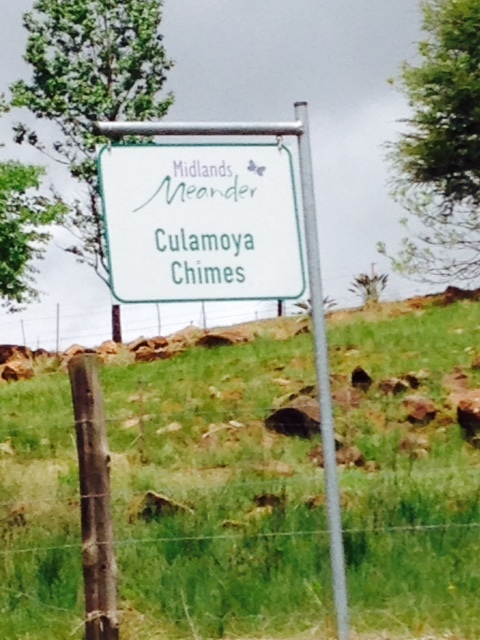 So not even winds, stormy skies and intermittent squalls of rain could stop me setting out on my own Midlands Meander on Saturday morning with Culamoya Chimes as my destination. I have always loved having wind chimes in the garden and it just so happens that the set of musically tuned ones I’d have for years had only recently been reluctantly retired. 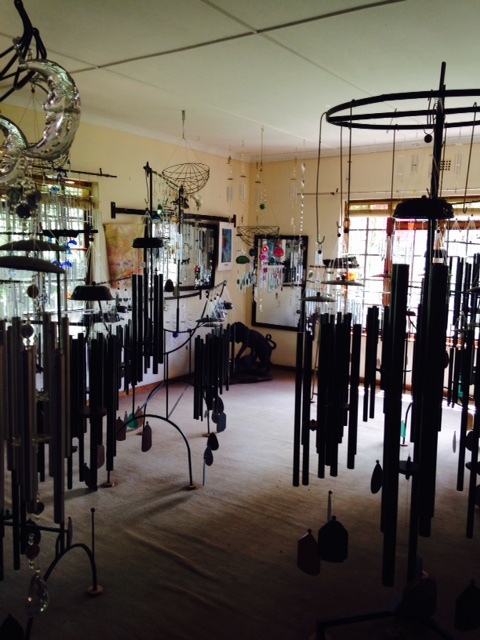 I was quite enchanted; not only with the huge chimes but also with the showroom and Frik and Lona Haupt, the makers of this vast array of musical chimes. It was really hard to make a choice; all had names and some pealed out the notes of St Pauls or Winchester Cathedral; some had higher tones than others, some were very small and slightly ‘tinkly’ while others were deeply resonant. One section of the showroom. I leant towards the deeper ones and eventually settled on one called ‘Cape’. Frik explained that the thickness of the tubes has an impact on the resonance of the chimes and it seems that quite unconsciously I had chosen a set whose sound ‘shouldn’t carry too far’ which is probably lucky seeing they will eventually hang in a small garden in a built-up neighbourhood. 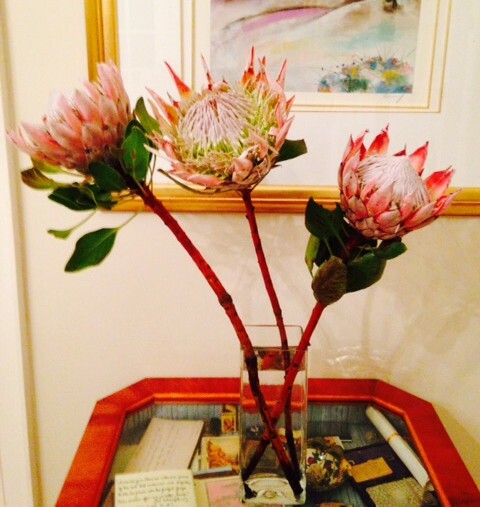 He wrapped them up very securely in bubble wrap and sent me on my way but not before he’d presented me with three beautiful long-stemmed proteas from his ‘daughter’s protea farm on the opposite hill’. I had not realised that proteas grew in that part of the country but when he pointed, there I could see them quite clearly, marching in pink rows across the hillside. Proteas in Jhb – all the way from Middle Earth. 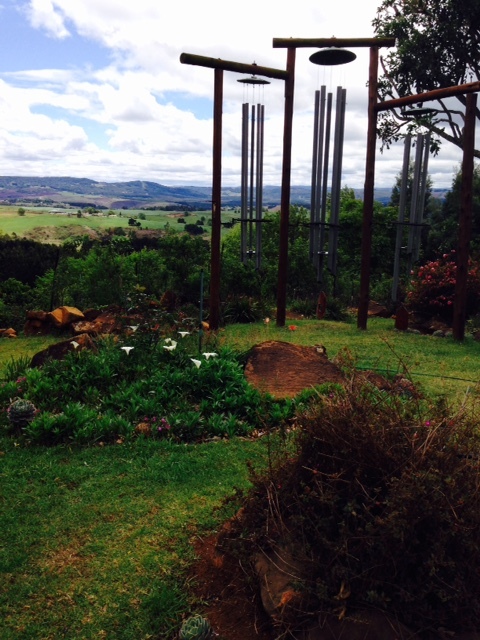 It was a magical morning and when my Cape Chimes are eventually installed in our new little garden I will enjoy the memories they evoke. You may have noticed that this blog has been a little quiet lately. 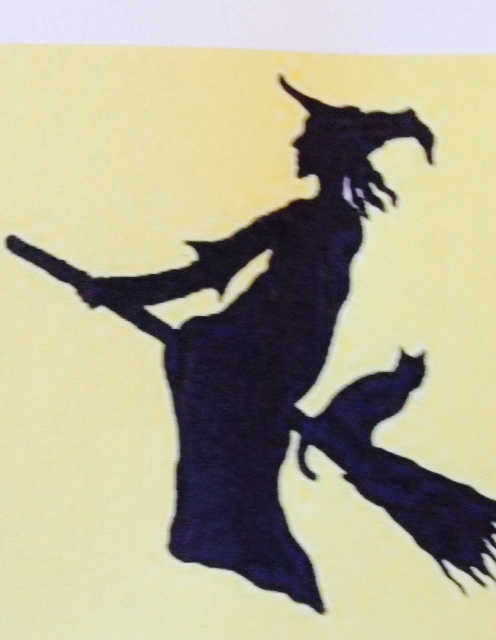 That’s because I’ve been busy dusting off my broomstick, donning my witch’s hat and taking flight over Parkhurst. Progress seems to have been painfully slow over the last month or so and I have taken to making regular, unscheduled site visits in an effort to keep a closer track of things. I had been warned that the closer one gets to the finishes, the slower things seem to be but this just seems to be extreme. 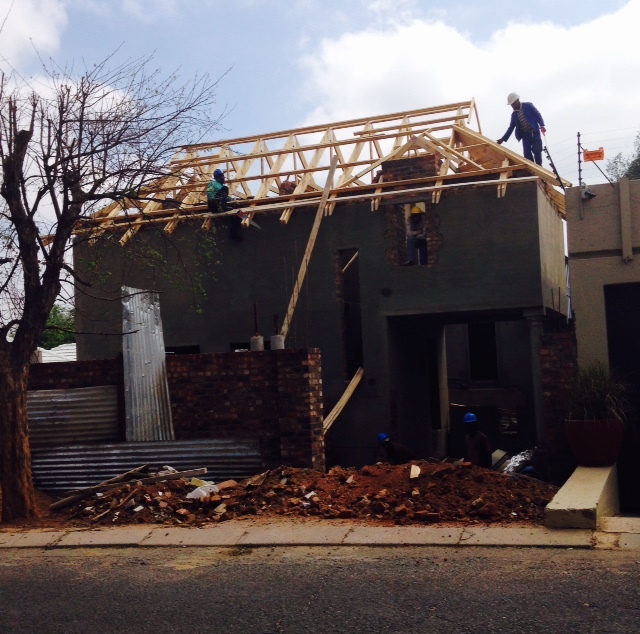 We have given up all hope of moving in this year although our contractor continues to blithely assure us that he will be ready to ‘hand over’ when the South African building industry closes for the month long summer holidays in mid-December. At this stage, I’m thinking February looks like a possibility but with each passing week I become less confident of that too. The roofing company that started off so well, disappeared after completing the house roof. In their defence, the cottage wasn’t ready for them at the time, but when it was, it took weeks and threats to get anyone back to continue. Yesterday, finally, they were there putting final touches to the trusses and hopefully the sheeting will go up within the next few days. Finishing off the cottage trusses. 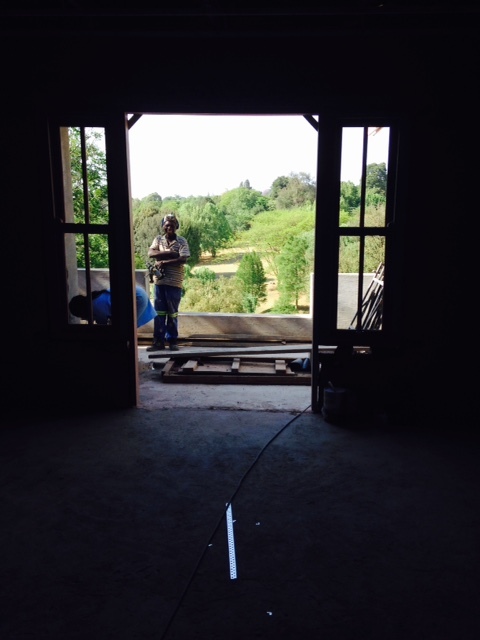 Windows being installed in the cottage. 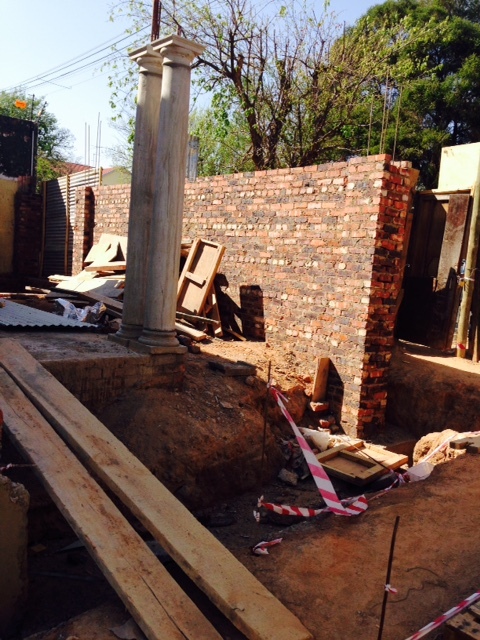 View of street boundary wall from the inside. Our neighbour on the left has also agreed to have the mishmash of walling between her property and ours replaced, having been adamant at the start of this project, that she wanted to keep it just the way it was forever. So that has come as something of a relief and Bernard has completed the drawings for the new one. We have agreed with her that the wall will be built in stages, so allowing her to move her dogs from one section of her property to another without the risk of them escaping. She is also very concerned about security and we need to be sure that the park boundary is pretty much impenetrable before we start on the shared one. So this part of the build calls for careful project management and diplomacy… Having all this time to play with leads to new ideas and changes which can be good but which probably also give Bernard and Mark sleepless nights. One such change is going to happen in the upstairs pyjama lounge. In this house, the pyjama lounge is essentially an extended ‘landing’ at the top of the stairs, between the main bedroom on the left and the two smaller bedrooms on the right. We started off with two windows facing north over the park but over the last few months, when visiting the house, I have found it visually irritating to arrive at the top of the stairs and being confronted with the panel of blank wall between the windows, rather than having an almost uninterrupted vista over the treetops. The view that currently greets one at the top of the stairs. 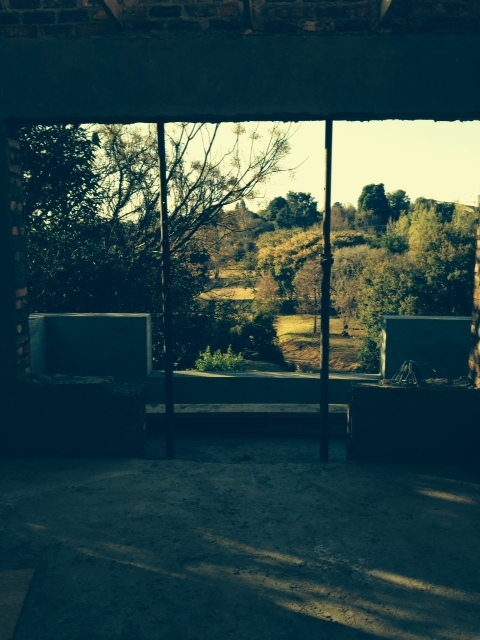 This is the outlook from the main bedroom. I’d like the pyjama lounge to have a similar view. Finally, when showing Australian relatives around the house 10 days ago and realising they felt the same way, I decided it was worth instigating a change. Of course, while the window frames have been delivered in fits and starts over the past few weeks, it so happened that those two had arrived and were already in place although not cemented in yet. I warned Nigel, the site manager, to leave them that way and started looking at other options. 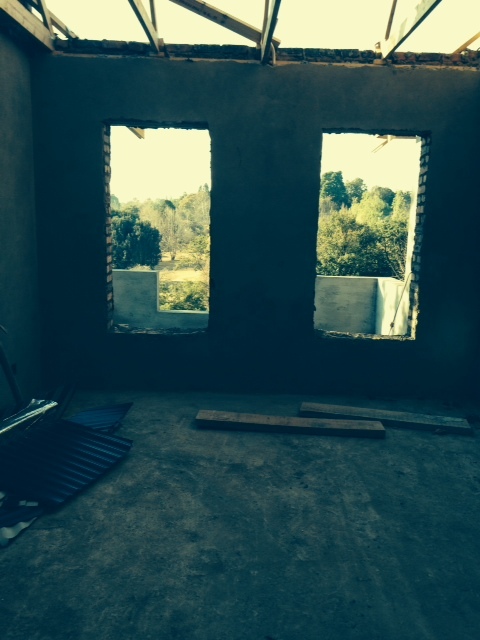 PJ Lounge window frames in place – but not for long. We haven’t made many changes to the original plans and strangely, those we have made have all involved windows. We added one to the main bedroom, removed one from the third bedroom and add a skylight in its place, removed one from the main bathroom and replaced it with a skylight and changed skylights in the cottage and guest suite into dormer windows. I don’t think I’ll regret any of these and most of all, I don’t think I’ll regret adding more glass to the pyjama lounge. 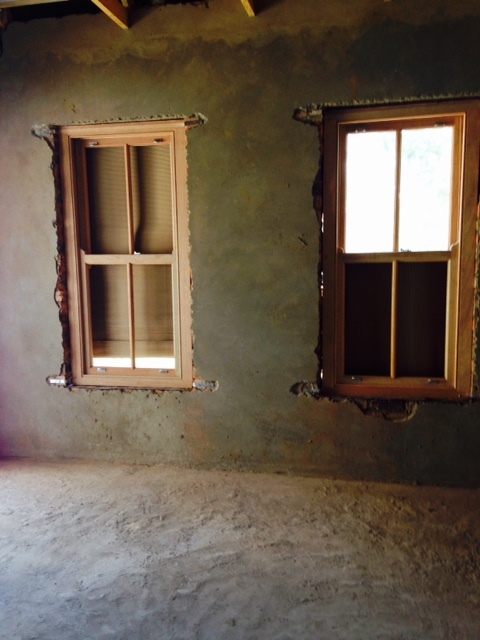 We’ve decided to replace the two windows with French doors, matching those opening onto the patio beneath. 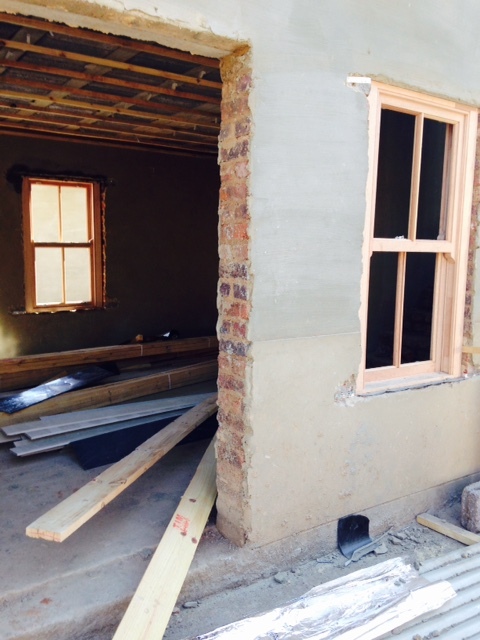 The doors will have narrow sash windows on either side. I was promised that the opening would be created yesterday so that I could at least see the effect. I popped in at the site this morning to find that had not happened despite a low-flying broomstick episode over the house earlier in the week. So I’ll be taking to the skies again on Monday.